A semiconductor has been created that can make use of infrared light to power an artificial photosynthesis reaction. The photocatalyst can split carbon dioxide into carbon monoxide and oxygen in what could be a new way to make the most of all of the sun’s energy. Technologies that mimic plants by harnessing solar energy to convert carbon dioxide and water into hydrocarbons and oxygen are highly sought after due to their potential for sustainable chemical production. While artificial photosynthesis systems are already more efficient than most plants, so far none have been able to harness infrared (IR) light – despite the fact that this makes up around half of the solar energy that reaches the Earth. ‘Since the first report of carbon dioxide photoreduction in 1978, IR light constituting almost 50% of the solar energy has never been utilised to drive carbon dioxide reduction to fuels. This could be ascribed to the fact that the energy of IR light is relatively low, and so cannot drive carbon dioxide overall splitting,’ says the University of Science and Technology of China’s Yi Xie. However, Xie and her team have now developed a semiconductor made of oxygen-deficient WO3 layers that is capable of absorbing IR light and using this energy to power the carbon dioxide splitting reaction. The introduction of oxygen vacancies to the semiconductor material creates an intermediate band energy level that enables the reaction to take place. ‘Semiconductors which have small enough bandgaps to absorb IR light do not possess sufficient redox potentials for photocatalysis such as water splitting or carbon dioxide reduction to occur,’ says Lianzhou Wang, who researches materials for solar energy conversion at the University of Queensland, Australia, and was not involved in the project. 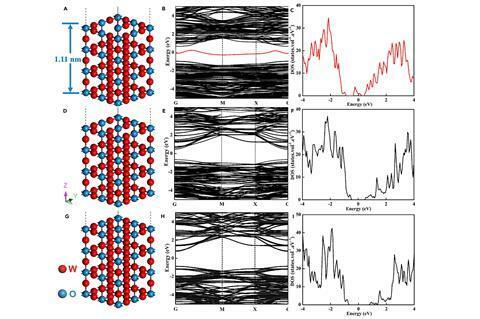 ‘Very encouragingly, in this work Xie and her co-workers have elaborately induced oxygen vacancies in ultrathin cubic-WO3 layers to generate an intermediate band, which can efficiently absorb IR light with wavelengths up to thousands of nanometres,’ he adds. This means that electrons can be excited from valence band to intermediate band, and then from the intermediate band to the conduction band upon absorption of photons with less energy than the band gap. ‘Hence, the low energy IR light could be used to drive carbon dioxide overall splitting into carbon monoxide and oxygen,’ says Xie. Promisingly, Xie’s team showed that their semiconductor’s catalytic activity continues without deactivation, even after three days of testing. Improvements to the material’s conversion efficiency would be needed before it could be used commercially, but the work demonstrates that the theoretical barrier that has so far prevented the use of IR light in artificial photosynthesis is, in fact, surmountable.